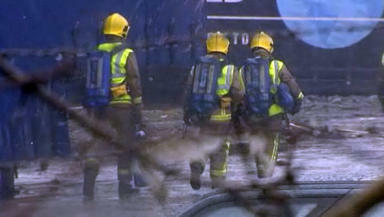 The facility in Cambuslang includes a mock-up town where crews can practice tacking major incidents. A £43m facility for firefighters to take part in realistic training scenarios has been officially opened. The Uaill training centre in Cambuslang, South Lanarkshire, uses a mocked-up town where fire crews can practice tackling burning buildings, road accidents and train crashes. Strathclyde Fire and Rescue chief officer Brian Sweeney says the facility is already paying off. He said: "Several months ago a crew of retained Strathclyde firefighters were first on the scene of a serious road accident in Ayrshire, where a motorist was trapped beneath an overturned car. "The crew had dealt with exactly that scenario here at Uaill only a week before and they were immediately able to put into practice a specialist procedure to safely free the man. "Whether it's practising the intricate work of freeing trapped casualties with potentially fatal injuries, or fighting dangerous flashover fires in dense, urban environments, there can be no better training than that which is available here. "This centre will be a tremendous asset to the new Scottish Fire and Rescue Service and every community in Scotland will be better protected as a result." Councillor Joe Lowe, convener of the Strathclyde Fire Board, opened the new centre on Friday. He said: "Uaill is an unparalleled asset to firefighters and our colleagues in the other emergency services, who can now experience a truly realistic scenario for the most challenging incidents first responders are ever likely to face. "Uaill will enhance our firefighters' already excellent skills and help ensure our communities continue to have the protection of a truly world-class fire service. "It is yet another example of the great firefighting heritage we have here in Strathclyde." The 77-week construction of the facility created 15 apprenticeship positions by contractors Lend Lease.